This post is modified version of a text published by Al Jazeera a few days ago. It is a sequel to the piece entitled “Toward a Jurisprudence of Conscience,” and will be followed by an assessment of the Russell Tribunal on Palestine session in Cape Town, South Africa investigating the allegations that Israel is guilty of imposing apartheid on the Palestinian people, considered by the Rome Treaty framework of the International Criminal Court to be a crime against humanity. In Kuala Lumpur, after two years of investigation by the Kuala Lumpur War Crimes Commission (KLWCC), a tribunal (Kuala Lumpur War Crimes Tribunal or KLWCT) consisting of five judges with judicial and academic backgrounds reached a unanimous verdict that found George W. Bush and Tony Blair guilty of crimes against peace, crimes against humanity, and genocide as a result of initiating the Iraq War in 2003, and in the course of maintaining the subsequent occupation. The proceedings took place over a four day period from November 19-22, and included an opportunity for court appointed defense counsel to offer the tribunal arguments and evidence on behalf of the absent defendants who had been invited to offer their own defense or send a representative, but declined to do so. The prosecution team was headed by two prominent legal personalities with strong professional legal credentials: Gurdeal Singh Nijar and Francis Boyle. The verdict issued on November 22, 2011 happens to coincide with the 48th anniversary of the assassination of John F. Kennedy. The tribunal acknowledged that its verdict was not enforceable in a normal manner associated with a criminal court operating within a sovereign state or as constituted by international agreement as is the case with the International Criminal Court or by acts of the United Nations as occurred in the establishment of the ad hoc International Criminal Tribunal for former Yugoslavia. But the KLWCT by following a juridical procedure purported to be operating in a legally responsible manner, which would endow its findings and recommendations with a legal weight that seems expected to extend beyond a moral condemnation of the defendants, but in a manner that is not entirely evident. 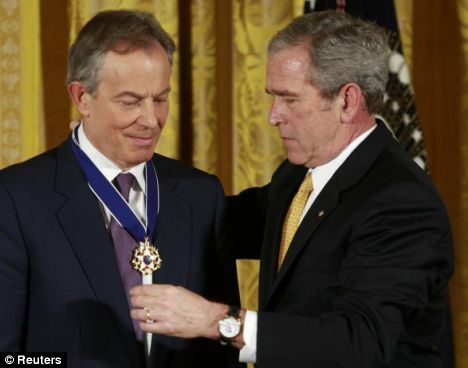 The KLWCT added two ‘Orders’ to its verdict that had been adopted in accordance with the charter of the KLWCC that controlled the operating framework of the tribunal: 1) Report the findings of guilt of the two accused former heads of state to the International Criminal Court in The Hague; 2) Enter the names of Bush and Blair in the Register of War Criminals maintained by the KLWCC. The tribunal these Orders by adding recommendations to its verdict: 1) Report findings in accord with Part VI (calling for future accountability) of the Nuremberg Judgment of 1945 addressing crimes of surviving political and military leaders of Nazi Germany; 2) File reports of genocide and crimes against humanity at the International Criminal Court in The Hague; 3) Approach the UN General Assembly to pass a resolution demanding that the United States end its occupation of Iraq; 4) Communicate the findings of the tribunal to all members of the Rome Statute (governing the International Criminal Court) and to all states asserting Universal Jurisdiction that allows for the prosecution of international crimes in national courts; 5) Urge the UN Security Council to take responsibility to ensure that full sovereign rights are vested in the people of Iraq and that the independence of its government be protected by a UN peacekeeping force. These civil society legal initiatives are an outgrowth of a longer term project undertaken by the controversial former Malaysian head of state, Mahathir Mohamed, to challenge American-led militarism and to mobilize the global south to mount an all out struggle against the war system. This vision of a revitalized struggle against war and post-colonial imperialism was comprehensively set forth in Mahathir’s remarkable anti-war speech of February 24, 2003, while still Prime Minister, welcoming the Non-Aligned Movement to Kuala Lumpur for its XIIIth Summit. Included in his remarks on this occasion were the following assertions that prefigure the establishment of the KLWCC and KLWCT: “War must be outlawed. That will have to be our struggle for now. We must struggle for justice and freedom from oppression, from economic hegemony. But we must remove the threat of war first. With this Sword of Democles hanging over our heads we can never succeed in advancing the interests of our countries. Mahathir stated clearly on that occasion that his intention in criminalizing the behavior of aggressive war making and crimes against humanity was to bring relief to victimized peoples with special reference to the Iraqis who were about to be attacked a few weeks later and the Palestinians who had long endured mass dispossession and an oppressive occupation. This dedication of Mahathir to a world without war was reaffirmed through the establishment of the Kuala Lumpur Foundation to Criminalize War, and his impassioned inaugural speech opening a Criminalizing War Conference on October 28, 2009. On February 13, 2007 Mahathir called on the KLWCC to prepare a case against Bush and Blair whom he held responsible for waging aggressive warfare against Iraq. Mahathir, an outspoken critic of the Iraq War and its aftermath, argued at the time that there existed a need for an alternative judicial forum to the ICC, which was unwilling to indict Western leaders, and he was in effect insisting that no leader should any longer be able to escape accountability for such crimes against nations and peoples. He acknowledged with savage irony the limits of his proposed initiative: “We cannot arrest them, we cannot detain them, and we cannot hang them the way they hanged Saddam Hussein.” Mahathir also contended that “The one punishment that most leaders are afraid of is to go down in history with a certain label attached to them..In history books they should be written down as war criminals and this is the kind of punishment we can make to them.” With this remark Mahathir prefigured the KLWCC register of war criminals that has inscribed the names of those convicted by the KLWCT. Will it matter? do its best to build ‘negative’ monuments in the public squares of global consciousness constructed with a deliberate intent to disgrace those guilty of crimes against peace and crimes against humanity. For too long our public squares have been adorned with heroes of war! In his 2007 statement Mahathir promised that a future KLWCT would not in his words be “like the ‘kangaroo court’ that tried Saddam.” Truly, the courtroom proceedings against Saddam Hussein was a sham trial excluding much relevant evidence, disallowing any meaningful defense, culminating in a grotesque and discrediting execution. Saddam Hussein was subject to prosecution for multiple crimes against humanity, as well crimes against the peace, but the formally ‘correct’ trappings of a trial could not obscure the fact that this was a disgraceful instance of ‘victors’ justice. Of course, the media, to the extent that it notices civil society initiatives at all condemns them in precisely the same rhetoric that Mahathir used to attack the Saddam trial, insisting that the KLWCT is ‘a kangaroo court,’ ‘a circus,’ a theater piece with pre-assigned roles. present their best defense, or if it was decided to mount a defense on their behalf, then it should have done as skillfully and persuasively as possible. reflect both the populist foundations of a jurisprudence of conscience. Although receiving extensive local coverage, Western media without exception has ignored this proceeding against Bush and Blair, presumably considering it as irrelevant and a travesty on the law, while giving considerable attention to the almost concurrent UN-backed Cambodia War Crimes Tribunal prosecuting surviving Khmer Rouge operatives accused of genocidal behavior in the 1970s. For the global media, the auspices make all the difference. The KLWCT did not occur entirely in a jurisprudential vacuum. It has long been acknowledged that domestic criminal courts can exercise Universal Jurisdiction for crimes of state wherever these may occur, although usually only if the accused individuals are physically present in the court. In American law the Alien Tort Claims Act allows civil actions provided personal jurisdiction of the defendant is obtained for crimes such as torture committed outside of the United States. The most influential example was the 1980 Filartiga decision awarding damages to a victim of torture in autocratic Paraguay (Filartiga v. Peña 620 F2d 876). That is, there is a sense that national tribunals have the legal authority to prosecute individuals accused of war crimes wherever in the world the alleged criminality took place. The underlying legal theory is based on the recognition of the limited capacity of international criminal trials to impose accountability in a manner that is not entirely dictated by geopolitical priorities and reflective of a logic of impunity. In this regard, UJ has the potential to treat equals equally, and is very threatening to the Kissingers and Rumsfelds of this world, who have curtailed their travel schedules. The United States and Israel have used their diplomatic leverage to roll back UJ authority in Europe, especially the United Kingdom and Belgium. To a certain extent, the KLWCT is taking a parallel path to criminal accountability. It does not purport to have the capacity to exert bodily punishment or impose a financial penalty, and rather stakes its claims to effectiveness on publicity, education, and symbolic justice. Such initiatives have been undertaken from time to time since the Russell Tribunal of 1966-67 to address criminal allegations arising out of the Vietnam War whenever there exists public outrage and an absence of an appropriate response by governments or the institutions of international society. The Lelio Basso Foundation in Rome established in 1976 a Permanent Peoples Tribunal (PPT) that generalized on the Russell experience. It was founded on the belief that there was an urgent need to fill the institutional gap in the administration of justice worldwide that resulted from geopolitical manipulation and resulting formal legal regimes of ‘double standards.’ Over the next several decades, the PPT addressed a series of issues ranging from allegations of American intervention in Central America and Soviet intervention in Afghanistan to contentions about the denial of human rights in the Marcos dictatorship in the Philippines, the dispossession of Indian communities in Amazonia, and the denial of the right of self-determination to the Puerto Rican people. The most direct precedent for KLWCT was World Tribunal on Iraq held in Istanbul (WTI) in 2005, culminating a worldwide series of hearings carried on between 2003-2005 on various aspects of the Iraq War. As with KLWCT it also focused on the alleged criminality of those who embarked on the Iraq War. WTI proceedings featured many expert witnesses, and produced a judgment that condemned Bush and Blair among others, and called for a variety of symbolic and societal implementation measures. The jury Declaration of Conscience included this general language: “The invasion and occupation of Iraq was and is illegal. The reasons given by the US and UK governments for the invasion and occupation of Iraq in March 2003 have proven to be false. Much evidence supports the conclusion that a major motive for the war was to control and dominate the Middle East and its vast reserves of oil as a part of the US drive for global hegemony… In pursuit of their agenda of empire, the Bush and Blair governments blatantly ignored the massive opposition to the war expressed by millions of people around the world. They embarked upon one of the most unjust, immoral, and cowardly wars in history.” Unlike KLWCT the tone and substance of the formal outcome of the Iraq War Tribunal was moral and political rather than strictly legal, despite the legal framing of the inquiry. For a full account see Muge Gursoy Sokmen, World Tribunal on Iraq: Making the Case Against War (2008). Two weeks before the KLWCT, a comparable initiative in South Africa was considering allegations of apartheid directed at Israel in relation to dispossession of Palestinians and the occupation of a portion of historic Palestine (Russell Tribunal on Palestine, South African Session, 5-7 November 2011). All these ‘juridical’ events had one thing in common: the world system of states and institutions was unwilling to look a particular set of facts in the eye, and respond effectively to what many qualified and concerned persons believed to be a gross historical and actual circumstance of injustice. In this regard there was an intense ethical and political motivation behind these civil society initiatives that invoked the authority of law. But do these initiatives really qualify as ‘law’? A response to such a question depends on whether the formal procedures of sovereign states, and their indirect progeny—international institutions—are given a monopoly over the legal administration of justice. I would side with those that believe that people are the ultimate source of legal authority, and have the right to act on their own when governmental procedures, as in these situations, are so inhibited by geopolitics that they fail to address severe violations of international law. Beyond this, we should not neglect the documentary record compiled by these civil society initiatives operating with meager resources. Their allegations are almost always exhibit an objective understanding of available evidence and applicable law, although unlike governmental procedures this assessment is effectively made prior to the initiation of the proceeding. It is this advance assurance of criminality that provides the motivation for making the formidable organizational and fundraising effort needed to bring such an initiative into play. But is this advance knowledge of the outcome so different from war crimes proceedings under governmental auspices? Indictments are made in high profile war crimes cases only when the evidence of guilt is overwhelming and decisive, and the outcome of adjudication is known as a matter of virtual certainty before the proceedings commence. In both instances the tribunal is not really trying to determine guilt or innocence, but rather is intent on providing the evidence and reasoning that validates and illuminates a verdict of guilt and resulting recommendations in one instance and criminal punishment in the other. It is of course impossible for civil society tribunals to enforce their outcomes in any conventional sense. Their challenge is rather to disseminate the judgment as widely and effectively as possible. A PPT publication in book form of its extensive testimony and evidence providing the ethical, factual, and legal rationale for its verdict proved sometimes to be surprisingly influential. This was reportedly the case in exposing and generating oppositional activism in the Philippines in the early 1980s during the latter years of the Marcos regime. The KLWCT has its own distinctive identity. First of all, the imprint of an influential former head of state in the country where the tribunal was convened gave the whole undertaking a quasi-governmental character. It also took account of Mahathir’s wider campaign against war in general. Secondly, the assessing body of the tribunal was composed of five distinguished jurists, including judges, from Malaysia imparting an additional sense of professionalism. The Chief Judge was Abdel Kadir Salaiman, a former judge of Malaysia’s federal court. Two other persons who were announced as judges were recused at the outset of the proceedings, one because of supposed bias associated with prior involvement in a similar proceeding, and another due to illness. Thirdly, there was a competent defense team that presented arguments intended to exonerate the defendants Bush and Blair, although the quality of the legal arguments offered was not as cogent as the evidence allowed. Fourthly, the tribunal operated in rather strict accordance with a charter that had been earlier adopted by the KLWCC, and imparted a legalistic tone to the proceedings. It is this claim of legalism that is the most distinctive feature of the KLWCT in relation to comparable undertakings that rely more on an unprofessional and loose application of law by widely known moral authority personalities and culturally prominent figures who make no pretense of familiarities with the technicalities of legal procedure and the fine points of substantive law. In this respect the Iraq War Tribunal (IWT) held in Istanbul in 2005 was more characteristic, pronouncing on the law and offering recommendations on the basis of a politically and morally oriented assessment of evidence by a jury of conscience presided over by the acclaimed Indian writer and activist Arundhati Roy and composed of a range of persons with notable public achievements, but without claims to expert knowledge of the relevant law, although extensive testimony by experts in international law did give a persuasive backing to the allegations of criminality. Also unlike KLWCT, the IWT mad no pretense of offering a defense to the charges. Tribunals of ‘Conscience’ or of ‘Law’? It raises the question for populist jurisprudence as to whether ‘conscience’ or ‘law’ is the preferred and more influential grounding for this kind of non-governmental initiative. In neither case, does the statist-oriented mainstream media pause to give attention, even critical attention. In this regard, only populist democratic forces with a cosmopolitan vision will find such outcomes as Kuala Lumpur notable moves toward the establishment of what Derrida called the ‘democracy to come.’ Whether such forces will become numerous and vocal enough remains uncertain. One possible road to greater influence would be to make more imaginative uses of social networking potentials to inform, explain, educate, and persuade. This recent session of the Kuala Lumpur War Crimes Tribunal offers a devastating critique of the persisting failures of international criminal law mechanisms of accountability to administer justice justly, that is, without the filters of impunity provided by existing hierarchies of hard power. So whatever the shortcomings of the KLWCT it definitely moved to close the criminal justice gap that now protects what might be called ‘geopolitical criminals’ from accountability for their crimes against peace and crimes against humanity, and this is a move, however haltingly, toward global justice and the global rule of law. This Tribunal may not be legally binding to Bush and Blair, but it is a symbolic and substantive step toward reestablishing international law against using lies and weapons of mass destruction on those only suspected of having WMD and committing mass murder and ruin through bombing, occupation, and torture. no cover up of this event in Austrian press nor in German speaking mainstream media – as to my knowledge. Maybe in smaller news paper but I haven’t found any article about this tribunal in my news papers. Anyhow, youtube has something and maybe other Internet sources too. Democracy and with it a global law applied to all whether politicans or individuals, whether West or East or North or South will only be installed when those since WWII acting and ruling ‘Crusaders for Dominance’ (as I see and call it by myself) will be overthrown. If this would install a more better world and understanding of law – I don’t know. The only thing I know is that going back in history arrogance and a steady growing governmental apparatus will or could lead to an implosion in a country whose rulers and/or politicans were too lazy to tackle real problems of their own state/country and failed to install better economic and social structures. So-called democratic Western countries don’t take responsibility for their doings, for their crimes, for their ordered torture. They rule by arrogance. Arrogance cannot work with a law where equality and responsibility are predominant. For the time being: yes I think too that even those not by mainstream media recognized tribunals are a first symbolical step. Slowly they could lead to more and more awareness. This because the Internet with its structure is in this way a helping hand. But in the end only overthrowing of those countries who commited and/or are still commiting war crimes (inclusive torture and civilians as targets) at the present will – maybe – open the door to globally and officially enacted indictments against politicans/military commanders/NATO commanders for their warcrimes. What credibility can have this court that was created by an authoritarian that left his own country in a big mess: religious fascism, a brand of apartheid, an alienated judiciary, Nazi style militias to hunt immigrants and other gross abuses of human rights? Although Bush is not a saint and probably would deserve to go to jail, this is a clown tribunal: would have been the same if Khadafy had set a “peace” tribunal to judge Sadam Hussein. HI EMIR , HOW SHALLOW YOUR KNOWLEDGE IS? HAVE U EVER COME TO MALAYSIA,, YOU DONT STUDY THE HISTORY OF THIS COUNTRY,……I LIVED IN MALAYSIA FOR 5 YEARS , NOTHING LIKE YOU SAID…………..IT IS A GOOD COUNTRY….TRUST ME AND MIRROR YOURSELF.! You know nothing Celine. I am actually living in Malaysia and I could add a lot more to my previous comment.